Upload Your Design & Start Promoting! Printing Xpert holds the vision to spread your message, either it has to be professional or requires creativity, such as 16.5x10.5 paper placemats for luncheons that has kids menu, or any special deal of the month. 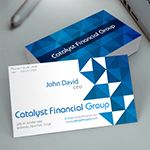 Try our high quality rack card printing at low cost. Our printed placemats are cost effective way to get your message across at events, luncheons, and more. Printed on a 60# offset paper, our standard, or custom made placemats are a great way to market your product or special offers to the customers. Our placemats for coffee shop are great to promote your cafe while customers are enjoying their beverages. We offer full color printed placemats with two binding options. Enhance the beauty of serving trays with our full color placemats and market your product at the table. 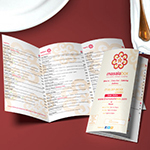 We provide quality laminated dine-in restaurant menus at low cost. Give puzzles in the kids menu or surprise dine-in deals, enhance your market and provide your services at a professional level with our placemats printing. 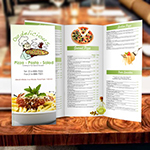 Check out our restaurant menu printing, we provide professional custom designs if needed. A cost-effective way to get your products marketed is through the full color placemats printing, we offer our services with eco-friendly printing materials , keeping in mind to keep your surroundings safe. Our printed placemats make great billboards at the table. Our placemats are printed on a high quality 60lb. premium offset paper, which holds a greater quality. We print placemats on 60 lb. premium offset paper, which is a better ink solvent material. We recommend using lighter ink coverage in your design when planning to print on this paper since excessive amount of ink may penetrate through the paper and become visible from the backside. 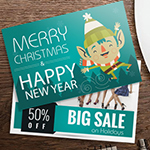 As a leading online placemat printing company, we offer top quality offset placemat printing and digitally printed placemats at an economy placemat printing prices. Offer a portion of your full color placemats printed real estate to other vendors in your area, and pay for your placemat printing purchase with the advertising revenues you will reap, or provide a coloring activity placemat with a children's menu for families dining in your establishment, and watch them come back when they recognize your business as a kid friendly establishment. We can print your custom placemats on a thicker stock or laminate your placemats for a more lasting place mats. Our placemats are of high popularity in fast food industry. They are easy to keep your serving trays clean, so you dont have to go through all that time consuming process to clean the trays every time you serve the customers. Custom printed placemats often include a menu or it can promote specials products and offers. Placemat advertising often uses placemat printing to promote other area businesses, creating a partnership between you and vendors in your area which can bring diners back again and again as they shop the wares of the advertisers on your full color printed placemats and return to your restaurant after their shopping is complete. We had paper placements for our bagel store, they came out great. it's worth it. These placemats are great. my customers take the full benefit of our lunchoens printed on them. my recommendation to fast food chains and restaurants. The placemats printed byPrinting xpert came out great and I would say that they definately work. I am greatly satisfied with their work and so will you. The specials are always new and exciting and you can see specials at a glance on the front page of the site. Online Free PDF Proof You can view a free online PDF proof that will allow you to double-check the Artwork, Text, Image Resolution, Color, Spellings and Fonts. *Only the first proof is free. After that it is $5 for each online proof Print As Is The files you uploaded will be printed as is, without any changes.